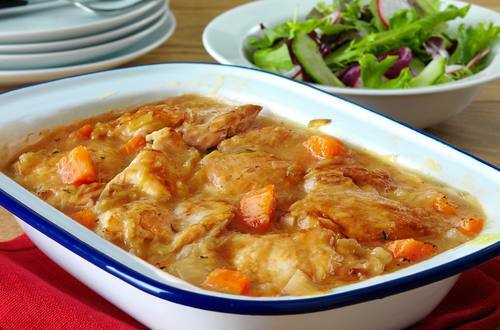 This Classic Chicken Casserole recipe is sure to leave you full and satisfied with its smooth and creamy texture from our real mayonnaise. 2 Brush chicken with Hellmann's® or Best Foods® Real Mayonnaise. Heat oil in large skillet over medium-high heat and brown chicken in batches, turning occasionally. Place chicken in 3-quart baking dish; set aside. 3 Add onion to same skillet and cook, stirring occasionally, until almost tender, about 3 minutes. Add garlic, potato, carrots and leek and cook, stirring occasionally, until vegetables just turn golden, about 5 minutes. Spoon vegetables over chicken. 4 Pour boiling water over Knorr® Homestyle Stock - Chicken and thyme in measuring cup and stir until Stock is melted. Pour over chicken and vegetables. 5 Cover and bake 2 hours or until chicken is very tender.